In 2009, data from the registry showed that six counties in the western Dallas-Fort Worth area had the highest incidence of invasive breast cancer in the state. These counties are Tarrant (which includes the city of Fort Worth), Denton, Wise, Parker, Hood, and Johnson. So, the counties with the highest rates of breast cancer in Texas are in Tarrant, Denton, Wise, Parker, Hood, and Johnson Counties. The counties with the most natural gas production are, Tarrant, Denton, Wise, Parker, Hood, and Johnson Counties. Coincidence? 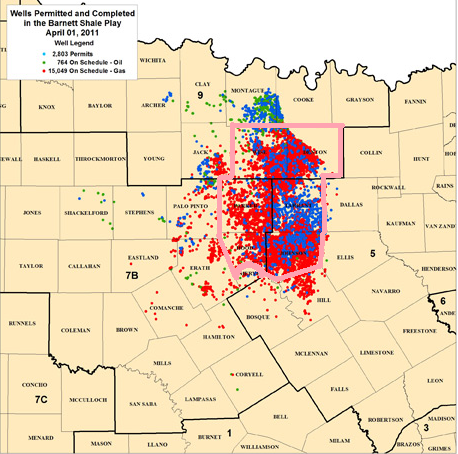 This map is from my presentation yesterday to the Dallas Drilling Task Force. Are these % or numbers.. Because it could be that more people live there, so the #’s are higher.. however, if it is percentages…then this does say something. I’m pretty sure that the CDC realizes that areas with more people would have more cancer. But based strictly on that, then Houston would have the highest rates. Some of those counties–Wise @ 55,000–are sparsely populated. The actual article explains that the numbers represent a rate of incidence: not a number or a percentage, it means how many cases per 100,000 people. Two teachers at Bailey Hr High did not return to teach cause one died from an aneurism (age 34) and the other has 4th stage spine cancer (TRIPLE MYLOMA just like in the Denton Cronicle article). Both teachers happened to be downwind from 5 wells that was fracked last January. See youtubes “Fracking Near Bailey Junior High”. Will any of these people or their families talk to me? Holy giant smoking gun Batman, its a giant smoking gun! Uh oh, Reality is taking a huge dump on the manufactured, P.R. schemed, fake reality of the Big Gas Mafia.